Lately I’ve been thinking about the backlog of electronic files that I should tag with metadata and that I should rename for consistency and ease of access. (I wrote about that in this post, It’s all about access.) When I think about doing all that, I get overwhelmed. And then I don’t want to do any of it. I realized though, that I don’t have to wait until the backlog has been completed to start establishing new patterns with new files that I save. It’s just like I tell my clients who have an overabundance of accumulated mail in their homes: They don’t have to go through all the old mail before figuring out how to handle the new mail. So starting today, I’m creating a simple file naming system for individual files. (I think it’s going to be Year-Document Type-First Name-Last Name). And all new files will be named accordingly. I’ll also work on creating the habit of adding metadata immediately after saving a file. So my new files will be in good shape and I won’t be adding to the backlog. At the same time, little by little, I can work through my backlog of files and change file names and add metadata tags. I can do it systematically. And I can also just edit the file name and add metadata every time I find myself accessing a file. One of my personal mantras is “Let it be easy.” This feels like an easy approach to a project that’s been causing me a little stress. It’s all about story. Gathering names, birth dates and death dates is the backbone of genealogical research. But filling in the gaps with stories is what brings the research to life. That might mean interviewing relatives. But it also means searching for documents (like court and probate documents) that can provide valuable information to fill in the blanks. Genealogists are generous. I heard a talk from Michael Cassara of DigiRoots who not only volunteers with Billion Graves to share information from the headstones of New York City’s Calvary Cemetery, he also buys old, identified photos from flea markets and tries to get them to the descendants of those pictured. How great is that? So inspirational. That kind of generosity inspired me to sign up as an obituaries indexer at FamilySearch.org. A conference of 10,000 people doesn’t have to be overwhelming. RootsTech was so well organized that except when the keynote session ended the first day and I was in a crush of people, I never felt overwhelmed. There were no long lines. Registration was lightning fast. It was truly professional conference and I’d go back in a heartbeat. I want to go back to the Family History Library. One evening, conference attendees were invited to the famed LDS Family History Library for research and pizza. Though the library staff were swamped, I was lucky enough to confer with professional genealogist Lyn Rasmusen who helped me confirm that my records on my great great grandfather, George Washington Adams, were correct. (I had stated worrying that I had him in the wrong regiment in the Civil War.) Just that little taste of the expertise and resources available at the library has me itching to go back! Incidentally, the video archive of RootsTech 2014 talks is now available. There are 14 classes and 3 keynotes available for you to watch from the comfort of your home, free of charge. I’ll be watching the classes, since I didn’t see any of them live. The keynotes were all great. I encourage you to take advantage of this great resource! I’m in Salt Lake City at RootsTech 2014, a fantastic conference. My brain practically hurts from all the learning. And being around thousands of fellow genealogy enthusiasts is really energizing. At the opening keynote, this lovely video debuted. I’ve enjoyed watching it since, and think you might like it too. If you weren’t able to come, you can still benefit from some of the learning opportunities. Some of the sessions will be live streamed. Check out the live streaming schedule and perhaps you’ll be able to schedule some time today and tomorrow to watch live. You can read session descriptions first, so that you can see whether the streamed sessions will be of interest to you. To watch live, just go to the RootsTech homepage. Streaming videos are right there. Some of the presentations will be archived. You’ll be able to find them here. Over at the RootsTech YouTube channel, you can watch interviews with various luminaries in the world of genealogy. This year’s conference is large, but extremely well organized so it’s not overwhelming. Next year’s will be super-sized, since it’s being held Federation of Genealogical Societies conference. Mark your calendars for February 12 to 14, 2015. I recently purchased a Livescribe smartpen. (That’s a referral link; if you buy from it I get a small commission.) I bought the pen in anticipation of attending the national conference of the National Association of Professional Organizers, which I attended earlier this month in New Orleans. I’ve also used it in client appointments. Now that I have had it for a couple of weeks, I realize it could potentially be very helpful with my family history research. What’s a smartpen? (Surely that’s a term coined by Livescribe.) As you take notes on its special paper, it records the audio of what you’re listening to and links it with your notes. So, in replay mode, when you touch the paper with the pen, you hear what was being said when you made that note. You can also upload the recording and images of your notes to your computer (or the cloud, depending on which version of the pen you buy). When you click on your handwriting in the uploaded images, you hear what was being said as you were writing. Think about that. It’s an audio recorder that’s linked to your written notes. So when you interview a family member, you can find what you want in the recording, based on your notes, instantly. If you attend a genealogy lecture (or conference), you don’t have to rely on your memory to understand your notes. 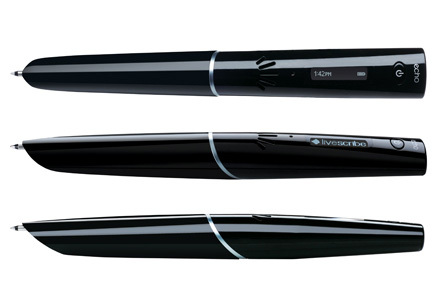 I feel like I have seen the future and it is the Livescribe smartpen. There are a few versions of this pen. I bought the Livescribe Echo, which is the penultimate version. (The Pulse, which is no longer for sale, was the first and the Sky is the latest.) The Echo requires plugging in a cable to get the data off the pen and onto the computer. The newer version, the Sky, has wifi and uploads directly to Evernote. I chose the Echo because I wanted to make a smaller investment and don’t mind plugging in the cable. On the advice of a Livescribe-loving friend, I also purchased the 3D recording headset, which produced really clear recordings, even in a noisy conference setting. Here’s a video about how the Echo (the version I bought) works. My investment was only $100, including the headphones, thanks to a referral discount and special going on earlier this month. To me, it was well worth the investment!